Much to my surprise I started to channel for the first time during a session at a meditation group in 2009. 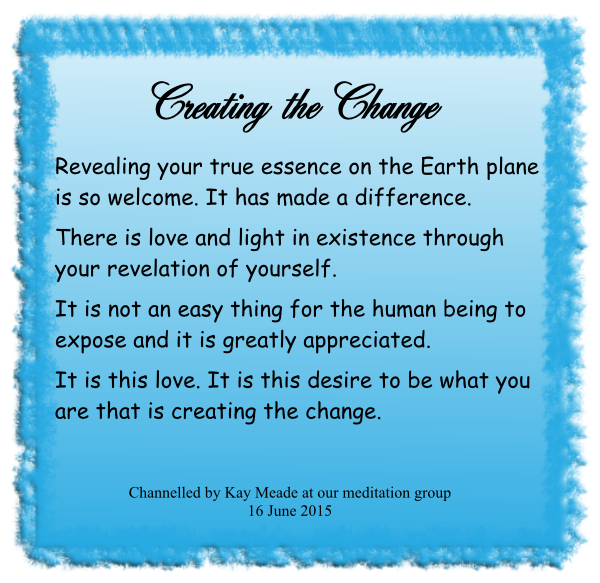 A group energy spoke through me and began to give the most beautiful messages about love and light. I have been channelling this group energy since then. In a later session at home with just Peter and myself they introduced themselves as the Circle of The Light of The Love Energy – the purest energy of all. 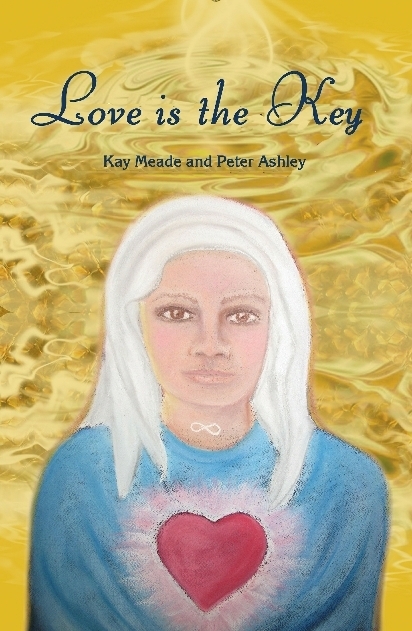 The story of this introduction is told in our first book of their messages Earth Messages of the Love Energy. Different things move us on our spiritual journey and make us curious to explore. What made me search more was the break-up of my 28-year marriage. However, this story started long before. When I was a teenager and also as a young adult I experienced a few out-of-body experiences. One such experience took me back to my college and I saw my marked English exam paper with 1st on it. This surprised me. The next day at English the teacher dropped my paper on my desk and as she walked away she said “64%”. I had a sinking feeling that my evening experience was not for real. But then the teacher said in a not so pleased voice, “and that’s first”. I was pleased, as it confirmed my ‘secret’ experience. At times I could see auras around people. This often happened at the most unexpected times. I questioned why we are here and believed there must be more to this life, that there must be a purpose. In discussing this with friends one night at a restaurant – one of them said I needed to meditate. He took me to the group where he meditated and this was a beginning. Some years later I was taken by another friend to the Spiritualist Church, and eventually joined a development group or ‘circle’ for a short period of time. Before my marriage break-up I had been diagnosed with an illness and told that I would need to take prescription medicine for the rest of my life. I took the medicine for a short while but had lots of side effects. This is when I explored natural health, spiritual healing and reiki. Another friend then told me of a meditation group and it was in this group that I started to see, with my third eye, a face appear. For months after that, every time I meditated I saw just a pair of bright wise eyes, then gradually the nose and mouth – it looked like a mask. The lady running this group then moved to Australia and the group closed. But I continued to meditate. Eventually I saw the whole face complete with wrinkles, hair and beard. Two more faces appeared in later meditation sessions. One was the face of a young woman with a veil over her head, no hair showing. Her picture is on the cover of this book and was drawn by Rachael Auton, a physic artist. The other image presented was a man with the most beautiful compassionate eyes and gentle manner. This is when I again felt the need to join a development circle at a Spiritualist Church to learn more about the part of me that is spirit. I don’t know exactly what I expected to learn, but it wasn’t to go into trance and have spirit talk through me! The first time this happened, my whole body felt full of energy and tingled during the entire transmission. My voice and mannerisms changed. I did not remember what was said, but I will always remember the amazing electric feelings. The others present told me that a wise-sounding being spoke through me in a powerful male voice, and that I was bent over like an old and frail man leaning on a staff. I shook and swayed from side to side. The others in the group were too occupied with trying to catch me if I fell, so not much notice was taken of what I actually said. As I continued to meditate, I received more messages. They said that they wanted to keep the messages simple and that information would be given in small stages. The messages given invariably finished with “please pass this message on”. So with my wonderful supportive partner Peter recording and transcribing the messages, this second book is born. Both Peter and I are quiet by nature and would prefer to be in the background. So it took some soul searching to produce the first, and now this second book. 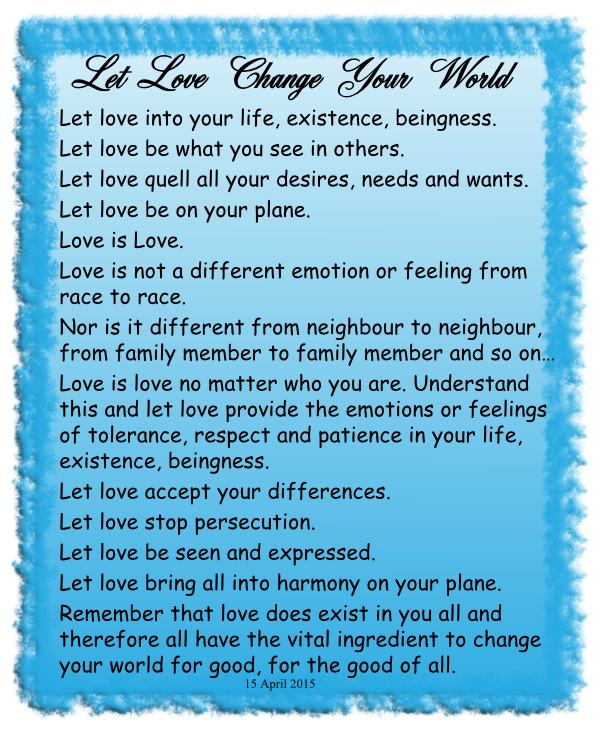 The messages are consistent and persistent – a plea for love to be on Earth – and this request is presented in many ways. 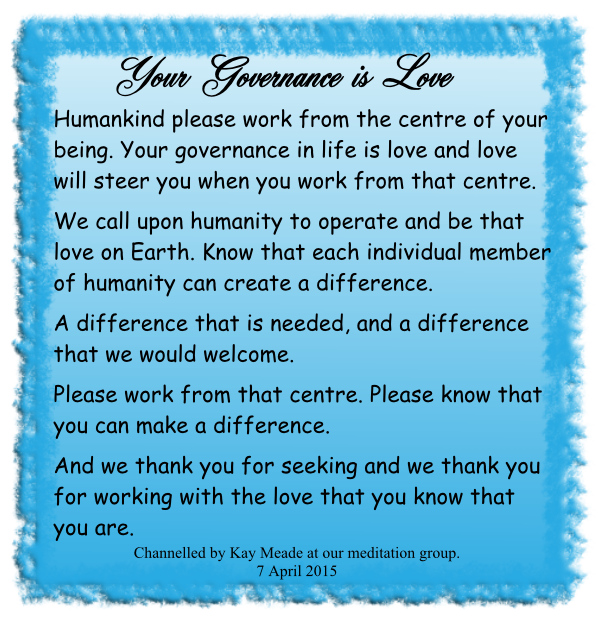 Despite our desire for privacy, both Peter and I feel so moved by these pleas that we feel compelled to pass them on so fellow seekers can share the guidance and messages of love. Our journey has opened up the field of energy healing and teaching to us. We are both Reiki Master Teachers and enjoy channelling this healing energy to others. Peter has recently completed the advanced training for Dolores Cannon’s Quantum Healing Hypnosis Technique. We now run our own weekly meditation group and it is wonderful to feel the energy increase, providing nurture to the part of us that is spirit. This is a world we would never have thought we would be entering just a few years ago. We would encourage readers to start their own meditation group, or join an existing meditation group. It is a great way to tune into the energy of pure love and to discover more about your spirituality. Read the messages with an open heart and see what resonates for you. We hope you will find it possible to help Earth and humanity by raising the energy of pure love in your thoughts and actions in life.